We aim to create infrastructure that will provide comparative trait analysis tools easy access to algorithms powered by machines reasoning with and making inferences from the meaning of trait descriptions. Similar to how Google, IBM Watson, and others have enabled developers of smartphone apps to incorporate, with only a few lines of code, complex machine-learning and artificial intelligence capabilities such as sentiment analysis, we will demonstrate how easy access to knowledge computing opens up new opportunities for analysis, tools, and research. We will do this by addressing three long-standing limitations in comparative studies of trait evolution: recombining trait data, modeling trait evolution, and generating testable hypotheses for the drivers of trait adaptation. The millions of species that inhabit our planet all have distinct biological traits that enable them to successfully compete in or adapt to their ecological niches. Determining accurately how these traits evolved is thus fundamental to understanding earth’s biodiversity, and to predicting how it might change in the future in response to changes in ecosystems. Although sophisticated analytical methods and tools exist for analyzing traits comparatively, applying their full power to the myriad of trait observations recorded in the form of natural language descriptions has been hindered by the difficulty of allowing these tools to understand even the most basic facts implied by an unstructured free-text statement made by a human observer. The technological arsenal needed to overcome this challenge is now in principle available, thanks to a number of recent breakthroughs in the areas of knowledge representation and machine reasoning, but these technologies are challenging enough to deploy, orchestrate, and use that the barriers to effectively exploit them remains far too high for most tools. We will create a centralized computational infrastructure that affords comparative analysis tools the ability to compute with morphological knowledge through scalable online application programming interfaces (APIs), enabling developers of comparative analysis tools, and therefore their users, to tap into machine reasoning-powered capabilities and data with machine-actionable semantics. By shifting all the heavy-lifting to this infrastructure, tools can programmatically obtain answers to knowledge-based questions that would otherwise require careful study by a human expert, such as objectively and reproducibly assessing the relatedness, independence, and distinctness of characters and character states, with only a few lines of code. To accomplish this, the project will adapt key products and know-how developed by the Phenoscape project, including an integrative knowledgebase of ontology-linked phenotype data (the Phenoscape KB), metrics for quantifying the semantic similarity of phenotype descriptions, and algorithms for synthesizing morphological data from published trait descriptions. 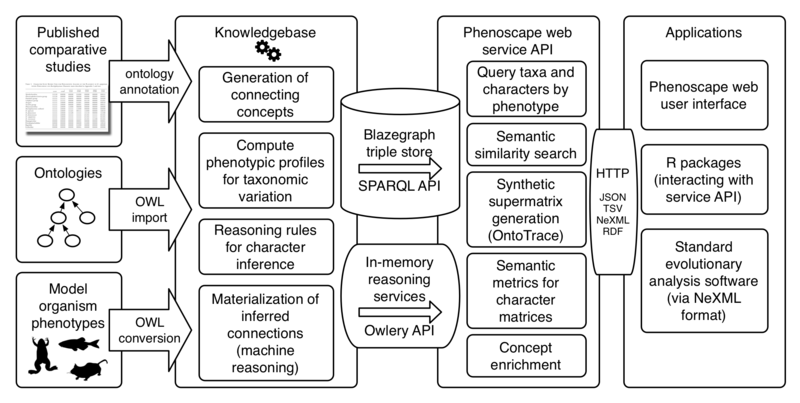 Generating testable hypotheses for adaptive diversification by incorporating semantic phenotypes into ancestral state reconstruction and identifying domain ontology concepts linked to evolutionary changes in a branch or clade more frequently than expected by chance. In addition, to better prepare evolutionary biologist users and developers of comparative analysis tools for adopting these new capabilities, a domain-tailored short-course on requisite knowledge representation and computational inference technologies will be developed and taught. Josef Uyeda (Virginia Tech), leading research, development, and applications of computable knowledge-informed probabilistic models for trait evolution. Duke University / Hilmar Lapp is recruiting student (undergraduate or graduate) programming interns to work on software development tasks driven by implementing user stories, in particular as part of the Rphenoscape package. Duke University / Hilmar Lapp is recruiting a computational biology graduate student (3 years) or postdoc (2 years) for developing algorithms, objective functions, and statistics for calibration and cross-study synthesis of morphological trait matrices. See aim I and development goals Ia, Ib, and Ic in the proposal text. Beginning in Jan 2018, Lapp will also recruit semester-long undergraduate student interns to help with software development goals. This project has been funded by the US National Science Foundation (NSF) as collaborative awards 1661456 (Duke University), 1661529 (Virginia Tech), 1661516 (University of South Dakota), and 1661356 (UNC Chapel Hill and RENCI) within the Advances in Biological Informatics (ABI) program. The start date was Sep 1, 2017, and the award is for 3 years.